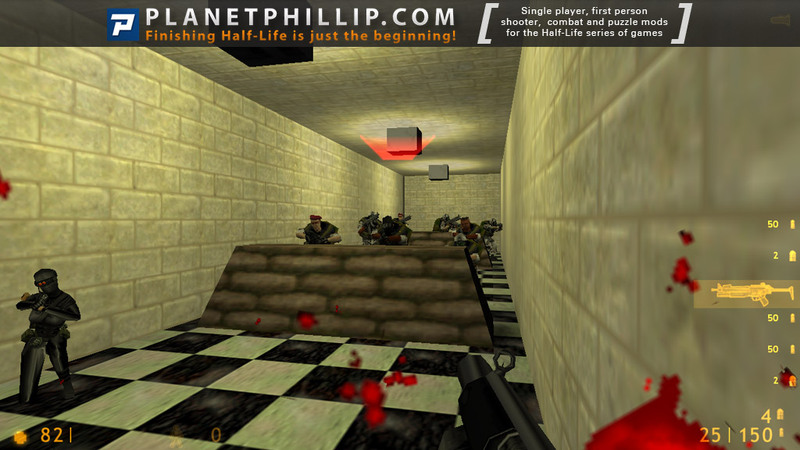 Copy armyatoffice.bsp into your Half-Life 1 Maps folder. Open the console and type map armyatoffice. Uh-oh… I expected the worst when reading the title of this one. And I was right. It’s a grunt fest. Half-Life prefabs only, put together with boring lightning into very bacis geometry and tons of grunts. Grunt-fest. Like it or hate it. Most likely you will die soon in this map, covered with grenades because the level is way to small for this amount of enemys. Hangar 16 reviews! They all crack me up! Stef has it right, one of the worst HL maps ever released into the wild. I think my description covers my feelings. It’s a very bad map and I don’t recommend you play it. I mean, it’s quite possibly the map where you more the least. You have enough ammo and it’s not particularly difficult. Just so you know, I was super rushed for today and these crappy maps will be posted when I don’t have much time. I am not going to play through this again, but will leave here comments I made in my own records way back. No game here just killing Grunts in a one room set. If you play this, then I feel sorry for you, try getting help or start a new life. Just kidding, someone somewhere will like it. If you play this, then I feel sorry for you, try getting help or start a new life. Wait. I just played it. Got to flip a coin now for the choices. You do realize if it lands on heads, I get a new life and close PP, don’t you? And I thought Rogat was bad!!! In the first image above you can just make out the assassin outside the door, so as soon as you get the MP5 and grenades, lobbing a grenade outside seems obvious to take out the assassin! OH NO it’s NOT. I tried it many times with and without the HEV suit and as soon as the grenade went off the game crashed with a fatal error. When you leave the room you are met with a barrage of grenades coming at you, so its a matter of leave the room lob a grenade and swiftly back into the room (at least that worked for me). The first barrage at least took out the assassin. This mod has no enjoyment value for me at all and its only day 4 with 2 absolute stinkers. I’m determined to get to the end of the 100 days, but there’s only so much I can take, may the Gman have mercy on my keyboard. I knew about this map for a long time since I read about it on city17.ru. It says that it has intriguing name but it’s very bad. So I never bothered to download and play it. But today, due to 100 days of nostalgia, I can’t wriggle out of it. The design is very simple, and the ceiling is textured with a wall texture. It’s good that the space is not empty – there are some props. This map uses a never before seen special effect. It corresponds big random black, sometimes red stripes which appear on the walls after the grenade explosion. The author probably thought that this effect is very cool… But since it relies on some bug with lighting system, the game might crash. When I finally fought back the soldiers, I was surprised – where’s my spectacular rewarding ending?! I searched, but couldn’t find anything. Instead, I found a leak! There are only one room and one corridor, and the author couldn’t complete this small task correctly! If it was longer, bug free, and had an ending, it’d deserve a “Think Twice”. But in its current state, even if you like very challenging fights, it is still not worth it. There are many better mods around. Are you kidding? This is definitely an unforgettable map despite the horrendous simplicity. First of all, the title. I have never seen a title this long, and I prolly never will. Secondly, this map is one of few maps that ever features leaks. (I know some mods that feature fullbright, but not leaks!) Also a plus is the correct use of office textures, which another map, Rum, failed to achieve. It is also better than Rogat due to the lower r_speeds, because the map is not loading a gigantic room that the goldsource engine chokes on. Overall, this map is better and stands out from some of its fellow maps of the same social class. I believe this is one of the maps that got me into mapping in the first place. At the time I thought: Wow, if this kind of map can be featured in all the HL modsites, then I can definitely make maps too! If you feel that you’d play a legitimate map rather than this, you can try my maps via the link from my name, and press the ‘maps” tab. Thank god I already commented on this map last year, or else I’d be forced to sit through it again. I had this on a disc. It was a corrupted archive file, so I couldn’t play it. I guess, I was lucky. Phillip, you should post Richard Gray’s work. 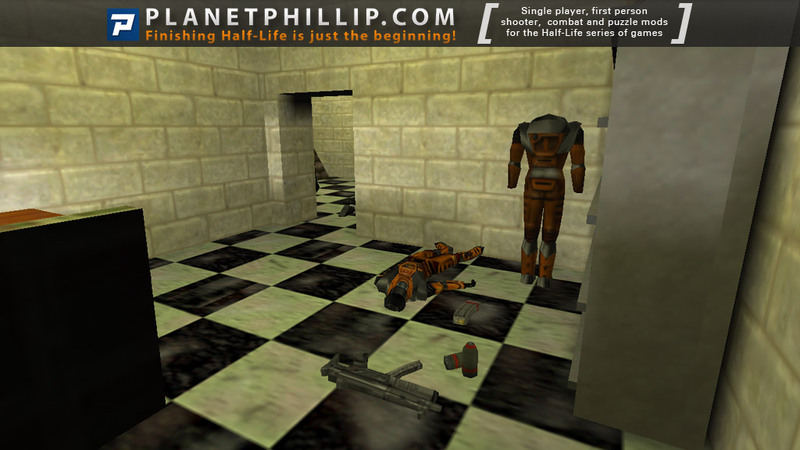 He made so many level packs for Half-Life. Geez, this is awful! Sorry but that’s the truth. There’s really very little I can say, really. Truly, though, this is one of the worst maps I’ve ever played. To start off, you begin in a square, boxy room. To be fair, it’s not too badly textured, apart from how a wall texture got on the ceiling, but still. You get your HEV suit and your MP5, plus contact grenades, and you go into the next room, which is a corridor. Shock horror, there are enemies here! Quite a few grunts and one assasin, to be precise. So you fire the grenades as the enemies, and they die! Yay! There’s nothing left to do! Wait, what? Yeah, I’m serious. This map consists of a small room with weapons and a corridor with enemies. That’s it. Like I said, the texturing isn’t appalling, but still, there is absolutely nothing more to this map. Well, okay, the lights seem to flicker if you hit them with a grenade, but I think that may well just be a bug. Other than that, it’s pretty much fullbright. Basically, this map is a waste of time in every way possible. Please, don’t play this. WOOOW, I think we have here our first “ROGATISH” map, really bad, I think the only cool thing about this map, was that the MP5 had the graneade launcher so ucan kill and tear appart all the bodies in a really bloddy way, includded yourself at the last of this 5second map! Only 5 maps in and we already have a map worse then Rogat. It’s two rooms, one with the HEV suit, 9mmAR and some ARnades and the other with loads of grunts and a fassn. You fire the grenades at the grunts and thats it, you’ve finished. To make things worse you crash if you try and lob a nade to the fassn or if the grunts fire their grenades. Really awful, worse than Rogat. This map is another beginner test map that probably shouldn’t have been released to the general public. Even as a test map, I feel that the map still didn’t succeed because it contained game killing bugs. For me, the map wasn’t as fun as the bug hunting I needed to do to in order to get it to work. 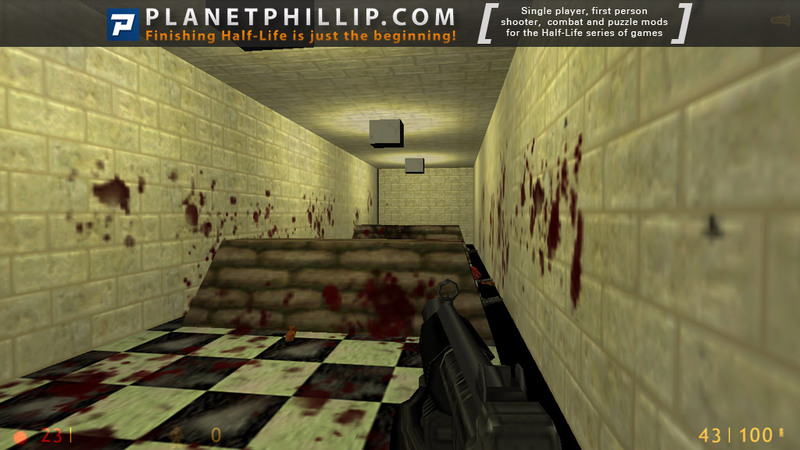 The most annoying bug that occurred was an error generated when grenades exploded, which causes Half-Life to crash. This created a slight challenge of needing to kill everything in about 10 seconds after being spotted, which is about the time before one of the grunts feels like throwing stuff around. This map falls into the corridor-with-room style beginner test map rather that the general kill-box style, with this variation starting you in the room and all the enemies starting in the corridor. The map may have been more enjoyable if there was more than one corridor and one room, with more attention to detail and maybe a goal, and if the map didn’t crash the game. As it is, this map is not fit for public consumption. This map is awful. Too short, takes 3 grenades to complete. Too many enemies in one area. Lamps are ugly. Generally, the aim for amateur mappers, apart from perhaps trying to gain a foothold in the industry, is to try and successfully emulate the original game’s levels, giving players a further installment of something they previously enjoyed. Andreas, however, has eschewed that approach, much as Hera did with the magnificent Rum. I’ve often found myself thinking that if Half-Life had one major flaw, it was the lack of tiny, pointless and incredibly badly-constructed maps. This review is republished here by permission and was originally published Thursday, 20th April, 2000 by Morgan. I’m sorry, I’m really sorry, but I hate this mod. I rarely put Avoid It recommendations, but this one was something else. Why does this map even exist? I say it is worst mod, i think. After i launched a grenade from launcher, HL crashed. So, I encourage you to play nice mods instead of this one.